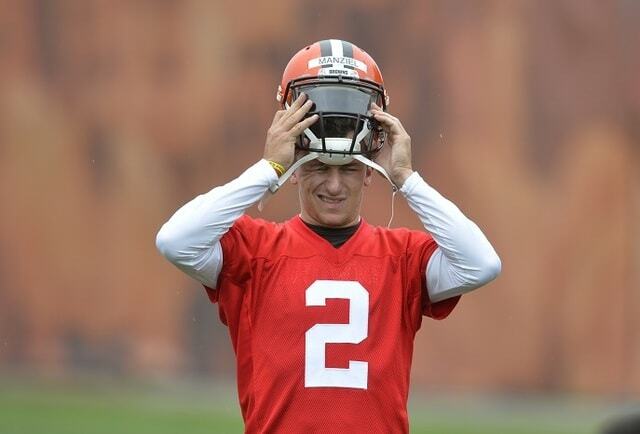 Cleveland Browns quarterback Johnny Manziel puts on his helmet Wednesday during NFL football minicamp in Berea. BEREA — Johnny Football became more than Johnny Manziel could handle. “It just overtook who I was as a person,” the Browns quarterback said Wednesday. Speaking to the media for the first time since spending 10 weeks in a rehab facility, the polarizing Manziel said he’s hoping to move past a regrettable chapter in his life. While he didn’t divulge the reasons for his stay in a Pennsylvania substance-abuse facility, Manziel acknowledged he got caught up trying to live up to a persona he helped create. One of the changes the former Heisman Trophy winner from Texas A&M intends to make is scrapping his trademark money sign, when he rubs his fingers together after a big play. The 22-year-old didn’t duck any questions and he reiterated that he was the one responsible for “a disaster” of a rookie season in the NFL. Manziel will enter training camp next month in the same place he was last summer — as a backup. He’s now behind Josh McCown on Cleveland’s depth chart, and there’s no guarantee Manziel will ever become a starter. But while his future on the field remains cloudy, Manziel said he’s taking the necessary steps in his personal life to be a better, more dependable professional. He recently moved from his downtown Cleveland apartment to a golf community on the city’s west side. It’s one of the changes he’s made to resist any temptations and improve his image as a spoiled party kid. “I think I’ve done a good job throughout this offseason of really trying to get back to my roots and who I really am as a person,” he said. Manziel regrets being a distraction last season, when he became a social media phenomenon as photos of him in Las Vegas or floating in a pool while swigging champagne went viral. There were other issues, including a scrape with a fan in his hotel lobby and a fine for oversleeping and missing treatment after he was injured. Looking back, Manziel wishes he would have acted differently. He’s been selfish, irresponsible — not a good teammate. Manziel is doing all he can to look ahead, what’s behind him is too painful, too embarrassing. “I’m trying to close that chapter in my life — not one that I’m very proud of,” he said. Manziel insists his priorities are in order. He claims to be more focused and dedicated to his craft. He’s talked a good game before, but this time he says he intends to match his intentions.